Whilst most visitors to the garden would easily identify the exquisite and fragrant flowers of a Magnolia, many are left uncertain once the trees have produced their conspicuous and equally exotic fruits. The pods start to form soon after flowering but take many weeks to ripen. 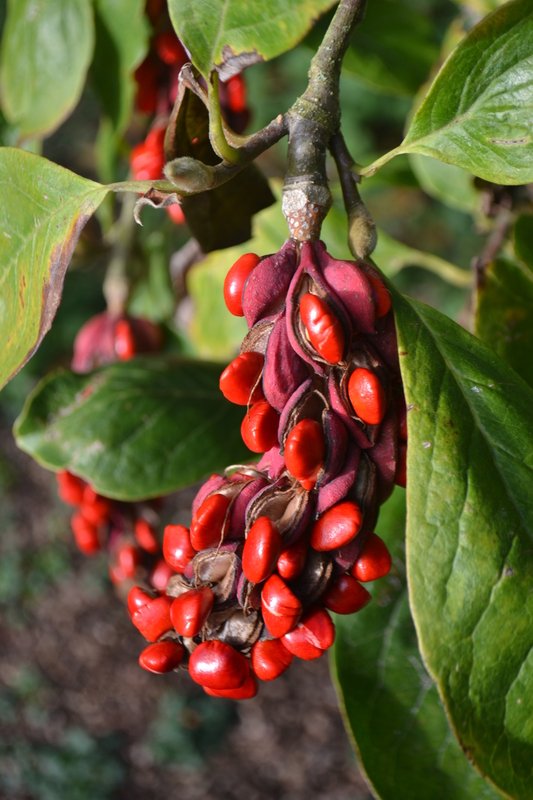 Whilst striding through the Delos garden recently, I was stopped dead in my tracks by the splendid sight of the Magnolia x soulangeana; its fruit had ripened and split to reveal the glossy, fiery red seeds inside – a sumptuous display of late Autumn colour. One noteworthy point – Magnolias are naturally surface rooting plants and one of the commonest causes of poor growth or even subsequent death, is planting them too deeply – which often leads to root suffocation. The collar should be well clear of the soil and the shoulders of the main roots where they join the stem barely below the surface, with a generous mulch of some loose, moisture retentive material such as leaf mould – providing the aeration necessary for free and vigorous root growth. This is especially true on heavy soils, such as our ‘Wealden clay’. One of my jobs last week was to cut the yew hedge surrounding the Herb Garden. 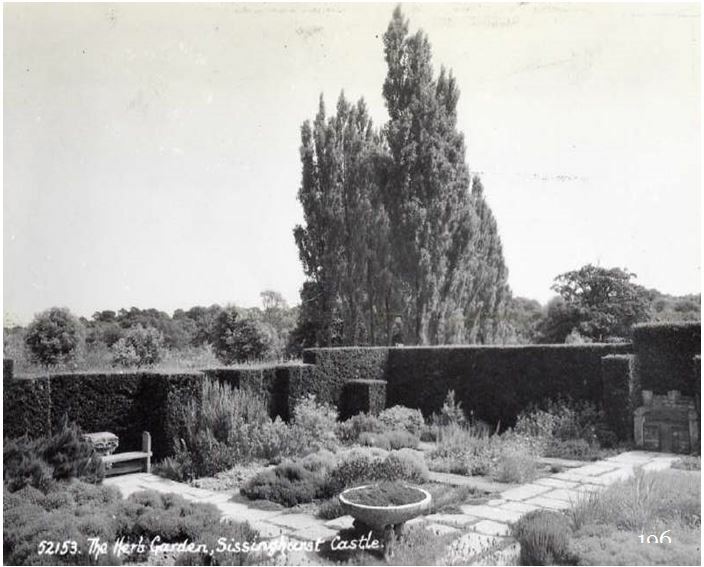 The hedge is currently completely flat along its top, but recent research has brought to light a photograph taken around 1950 which clearly shows some steps cut into the top of the hedge which Troy, our Head Gardener is now considering re-introducing. Rather frustratingly, the Herb Garden hedge is the only formal yew hedge at Sissinghurst which is not level across its top, it slopes just slightly less acutely than the slope of the ground around it. We’re also pondering the possibility and practicalities of addressing this issue at the same time. 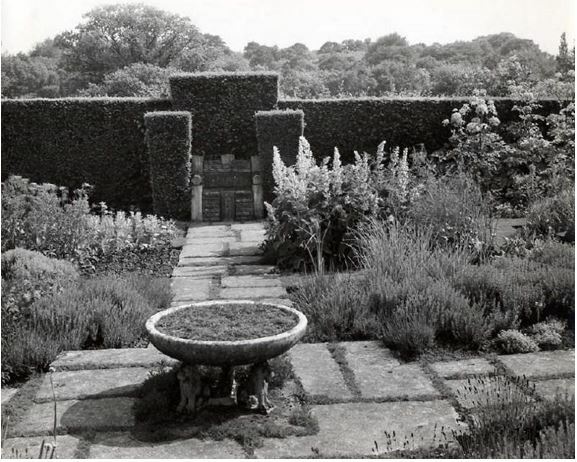 A photo from the 1950’s showing steps cut into the Herb Garden hedge. This year we decided to bone back certain sections of this hedge which have greatly outgrown their allotted space. This includes the Nuttery entrance, which was becoming an increasingly narrow passage way. The chamomile seat, also known as Edward the Confessor’s Chair. The Herb Garden hedge after renewal. One of the great advantages of yew, is that you can cut it hard back to the trunk, and it will grow back, so long as it’s healthy. If you were planning on doing this at home, I would strongly recommend cutting back one side, and leaving the other side until the following year, at the very earliest. It is also better to cut it right back, and not half way – be brave!